Figure 1. 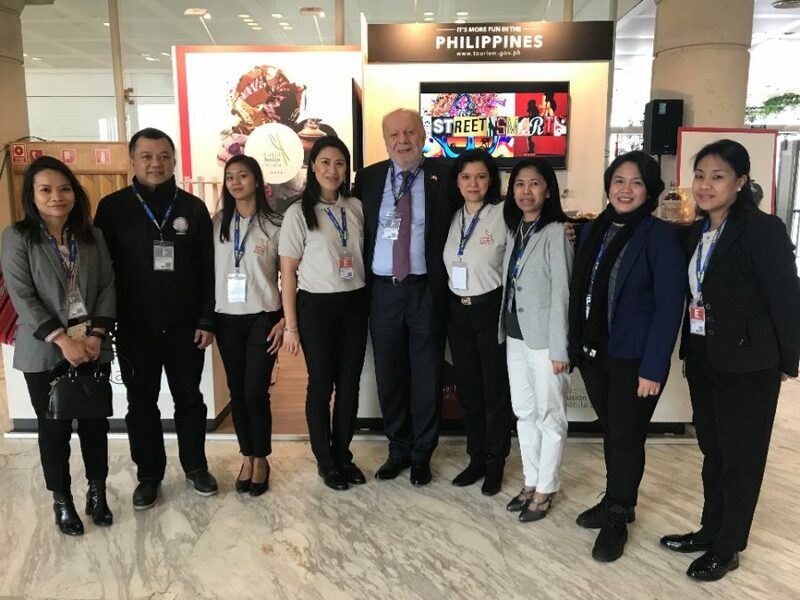 The Philippine delegation led by Ambassador Lhuillier and DOT Madrid Fusion Program Director Pamela Samaniego at the Philippine stand. Figure 2. DOT Director Pamela Samaniego (far left), Director of Madrid Fusion Lourdes Plana (second from right), Ambassador Lhuillier (center), Filipino Chefs Jordy Navarra and JP Anglo (center and far right respectively). Figure 3. Ambassador Lhuillier delivers his remarks at the welcome reception for the launch of Madrid Fusion Manila 2018. Figure 4. Chef Jordy Navarra presents the philosophy behind his restaurant, Toyo Eatery, during Madrid Fusion. Figure 5. 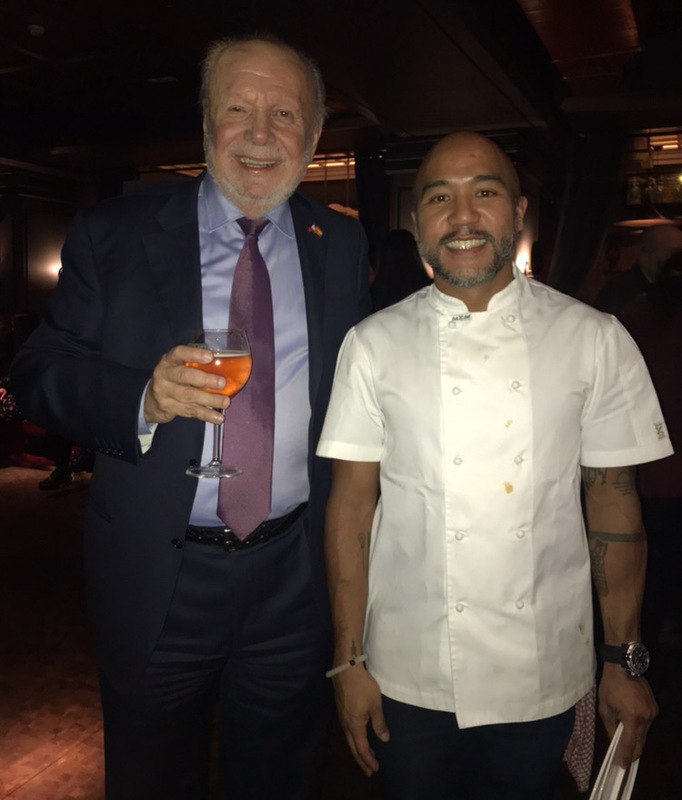 Ambassador Lhuillier with Chef JP Anglo, who created cocktail dishes for the guests during the welcome reception for the launch of Madrid Fusion Manila. Chef JP Anglo will also be presenting in Madrid Fusion Manila in April 2018. 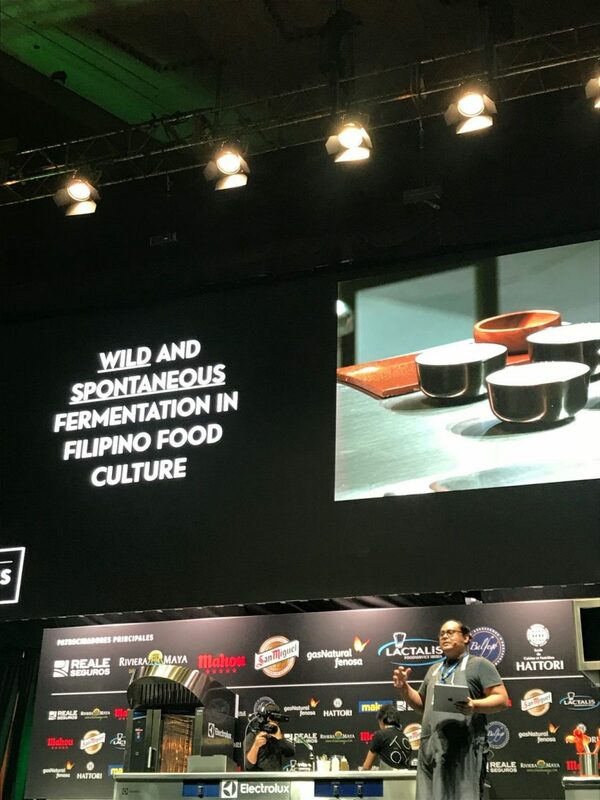 The 4th edition of Madrid Fusion Manila was launched on 24 January 2018 at the Palacio Municipal del Congresos in Madrid, following the presentation of Filipino Chef Jordy Navarra on his restaurant “Toyo” and his food philosophy during Madrid Fusion 2018. On hand to mark the occasion was Department of Tourism Madrid Fusion Program Director Pamela Samaniego, Philippine Ambassador Philippe J. Lhuillier, and Madrid Fusion Director Lourdes Plana. 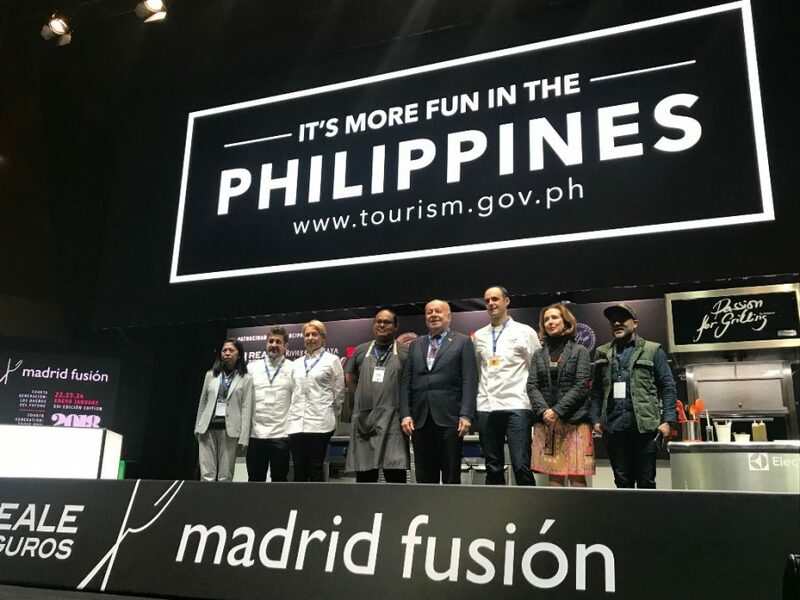 In her speech at the launch, Director Samaniego expressed her gratitude to the organizers of Madrid Fusion for collaborating with the Philippines in hosting one of the biggest culinary events in Asia. She further noted that the event allows for the expansion of the conversation on the future of food to the Philippine side of the globe while the Philippines’ culinary industry has awakened, and its chefs and students have been inspired by the knowledge imparted by world famous chefs during Madrid Fusion Manila. 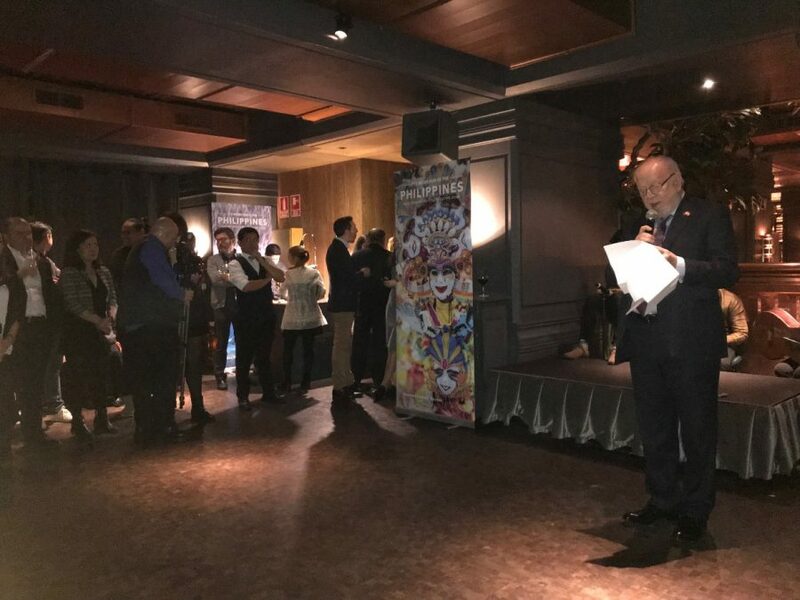 During the reception to celebrate the launch of Madrid Fusion Manila, Ambassador Lhuillier welcomed the guests and commended the dedication and passion of the organizers, Madrid Fusion and the Philippine Department of Tourism, to guarantee a successful Madrid Fusion Manila. “Your commitment to ensuring a bigger and more impactful Madrid Fusion Manila ensures a wonderful platform for the exchange of gastronomical and culinary learning and business between Asia and the rest of the world. Most importantly, it allows us to continue to celebrate creativity in haute cuisine,” according to the Ambassador. Each year, Madrid Fusion Manila has grown steadily with the participation of thousands of delegates, attendees, exhibitors. In 2017, it reached close to 10,000 attendees, which is more than double the number of participants during its first year. This year’s event will be held on 19-21 April 2018 in Manila, with some of the biggest names in the culinary world presenting, including Chef Iñigo Lavado and Chef JP Anglo of CNN Philippines’ Hungry with Chef JP.